Happy May! The multiple bank holidays this month definitely always makes May a high point of the year I think. There’s also the promise of summer sunshine (please can we have some more soon? And can we have less of the rain and cold temperatures?!) and more sun is also a major plus. I'm probably going to have a fair amount of waiting around time in the next few weeks so I'm planning on getting lots of books read. April ended up being a really good book month as I managed to read three and a half books. Woo! I know that doesn't sound like much to many people, and years ago it probably wouldn't have been much to shout about, but these days it's a big ol' plus! So last month I read Chimamanda Ngozi Adichie’s Half of a Yellow Sun, Ben Aaronovitch’s Rivers of London and Jessie Burton’s The Muse. I also made a start on Dictator by Robert Harris whose books I love. This one is the last in the Cicero series he’s written and it’s weird reading it knowing what’s going to happen. This bank holiday weekend was a mix of work and fun and a whole bunch of family time. It was one of the first times this year when my sisters and I have all been together. Actually, I think it might have even been the first time since Christmas. We all went to see The Red Shoes which was amazing, and then we even fitted in watching How To Train Your Dragon (niece’s choice!) and R made us all Beef Bourginon followed by apple pie. Yum. This weekend we progressed some more with re-decorating our living room, as you can see in the picture the wallpaper stripping started. We now have one scraggy yellow wall, It's exciting to see how it's all progressing, even if it does take time. 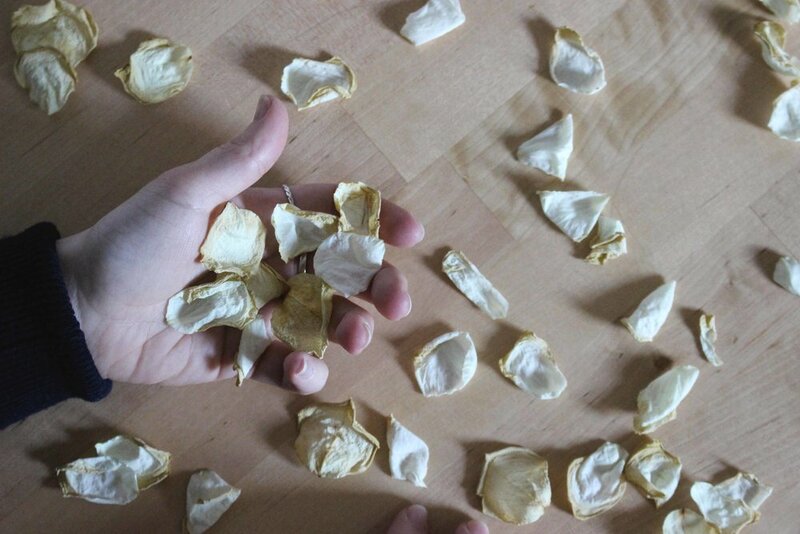 This last month I've also been saving up all my dying flowers and drying the petals to use in a paper making workshop I'm running soon (plus they make fun photo props!). I’ve still been loving the Big Little Lies soundtrack, and a few particular songs have even made it into my May playlist because they’re just awesome. I hope you enjoy it! Have you got much planned for May or things to look forward to?